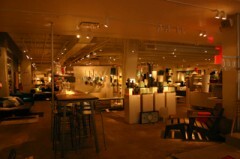 At a media preview of the sizable M Street store, one of CB2′s employees mentioned feeling that DC was a prime market for their line and they had wanted to enter this market for some time. Even if one did decorate straight from the very expensive, very… Georgetown Thos. Moser shop a block away from CB2, the store also sells a variety of simple, modern glassware, dishes, and serving items that would fit a variety of styles at a great value. There are seasonal pieces – right now geared toward entertaining on balconies and rooftops for the summer – but also more classic pieces with great shapes that belie their price tags. 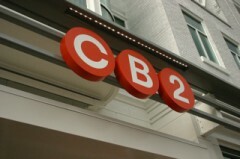 To mark their arrival in DC, CB2 will be donating a portion of all opening weekend sales to The Capital Area Food Bank. Also, prior to the opening, shop employees hid and handed-out bright orange ping pong balls in Dupont Circle, Logan Circle, and Georgetown. If you received or found one, it can be brought in on Saturday or Sunday to see if it has one of the winning codes, worth up to $1000 in prizes being handed out. I checked it out myself. It’s inexpensive and perfect if you have a small space to decorate.